I sent an email to a radio program called “To The Best of Our Knowledge”, an internet radio program produced by Wisconsin Public Radio, to see if it was OK to share their scripts on LingQ. I happened to find this program when I was searching for a podcast for my English study in 2008, and I became a huge fan of this program. In this program, the host invites several book authors to discuss their books. It helped me a lot to find good books to read, and their intellectual conversations inspired me to learn about various topics related to the books. Besides, I love the interviewer’s voice, the way he talks, and how he asks difficult questions without offending the author. I recommended this program to my fellow English learners before, but the contents seemed difficult for ESL students to understand without transcripts. Then, I realized that some of the new episodes have transcripts on the website. I thought it would be helpful to other people if we could share their transcripts and MP3 recordings on LingQ. As I couldn’t find a copyright statement on the website, I decided to ask for permission by email. I was hesitant to send an email for fear of being ignored or rejected, but even if the reply would be disappointing, I could still use the downloaded materials without violating copyright infringement if I used them for personal use only. I wrote about how I came to know their program, how much I appreciated it, and how helpful it was not only for my English study but also for my life along with the permission request. I didn’t know who to send my email to, so I addressed the email to the editor of the program. Several days later, I received a reply from the program. To my astonishment, it was from Mr. Jim Fleming, the host of the program whom I admire so much! Although, I couldn’t get permission to use the transcripts and MP3s on LingQ, the email made my day. He wrote that they are glad to know that I am listening to their program and enjoying it so much. I am soooo excited that he wrote me back, and felt extremely happy that I had a good opportunity to tell them about my appreciation of the program. I’ve finished listening to the audiobook version of a modern retelling of Shakespeare’s “Macbeth”. I read some of the Shakespeare’s works in Japanese when I was a kid, but I forgot most of them. When I read “Team of Rivals”, which describes how much Lincoln loved and cherished Shakespeare’s plays, I felt compelled to read Shakespeare and see if they are worth taking the time to read again. 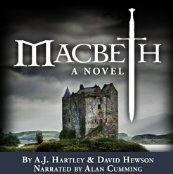 The audiobook I chose was “Macbeth: A Novel”, which was written by the British best-selling crime author David Hewson with the help of A.J. Hartley, a profossor of Shakespeare. This book is a modern interpretation of the original Macbeth, which is easy to understand and enjoyable to listen to. Macbeth is a Scottish general who is a fearsome soldier and who was a royal subject to his King, Duncan. When Macbeth and Banquo, his best friend from childhood, encounter three witches on the way back from a battle, the witches gave prophecies of Macbeth’s rise as a king, and Banquo’s descendants becoming kings. They were skeptical at first, but some of the predictions soon came true, and their ambitions for the throne took over their rationalities. The night the King anointed his eldest son as his successor against custom, which did not allow succession to the throne through inheritance, Macbeth and his wife brutally murdered the king in his sleep, and blamed the crime on Duncan’s sons. The King’s sons fled to England for fear for their lives, and Macbeth succeeded to the throne afterward. All seemed went well, but the knowledge that he slew a sleeping King in his own house holding was eating away at his conscience. The anxiety from his guilt gave rise to one suspicion after another and he had to commit further crimes to cover up his previous misgivings until they led him to his cruel fate. Although it was Macbeth who brought in all the pain and suffering, I felt as if it was I who committed all the crimes. The pang of guilt I felt was so intense that it was unbearable to continue to listen to the story. I suffered as much as Macbeth, and the story was grim and depressing, but yet, the story was compelling, and definitely worth reading.